The Vermillion Hutterite Colony southwest of Winnipeg is no longer relying on coal to heat its buildings, because they are now relying on renewable bio-heat. "We burn wood chips, feed them into the fire and it keeps burning, and it heats water pumps, hot water underground to all our buildings," said Shawn Gross, the biomass furnace operator. The colony says it’s reducing its carbon footprint by trucking in 15-tons of wood chips that are then funneled into a furnace, which then heats the entire colony for 6 days during the coldest months. 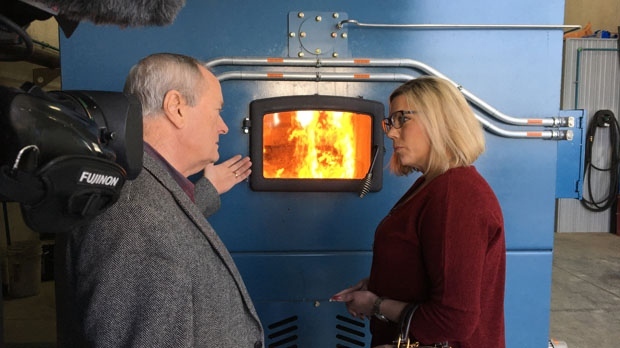 On Tuesday, the community invited Minister of Sustainable Sevelopment Rochelle Squires to take a tour of its biomass furnace. Squires says this is the future of heating buildings and that the province wants to help entrepreneurs reduce their carbon footprint. "Our Made in Manitoba Climate and Green Plan has a funding commitment so we will be funding clean tech," said Squires. The province plans to spread awareness of renewable bioheat to industries across Manitoba. "It will take a collaborative effort, working industry, innovative entrepreneurs and government all working together,” said Squires. Gross said the colony made the switch due to the emissions tax on coal, after it became too expensive. It’s been two years of using bioheat and the colony paid off its $600,000 investment.